There are various goals that I have as an instructor. First of all, I would like to share my love of art and needlecraft. I would also like to show my students how amazing it is to create things with their own hands! I believe that anyone can draw, do needlecraft or create other handmade things at any age. Just do it – learn, practice, practice and again practice! While teaching, I would like to support the desire of my students to practice, thereby exposing them to a very interesting world of art and needlecraft history and involving them in an enjoyable process of creating. During the classes, I combine my Russian and Canadian study and work experience. I believe that home tasks, which are given individually, are necessary since it is another opportunity to practice! By presenting a variety of basic techniques and supplies, I hope it will inspire my students to continue learning favorite techniques more deeply with me, independently or somewhere else. 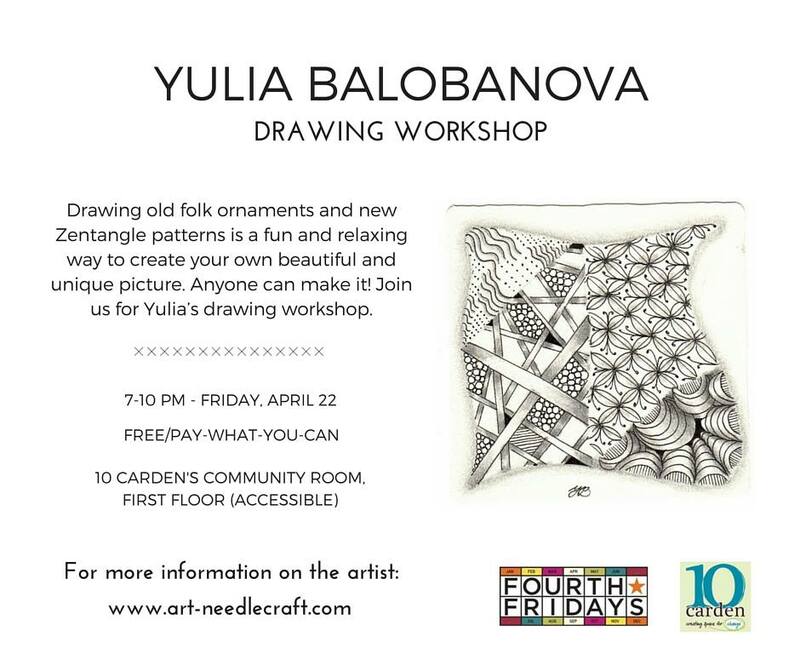 If you’ve become inspired to draw just like Yulia, then RSVP to our event on Facebook. See you there! This entry was posted in Art, Fourth Fridays, Workshop and tagged drawing workshop Guelph, Fourth Friday's events, Guelph events by Fourth Friday. Bookmark the permalink.